HYDE — A tale of two halves described what a packed Bison Gymnasium of fans got to witness on Monday night. 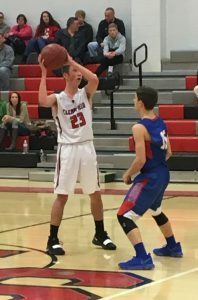 The Clearfield Bison, coming off a season-opening win against Curwensville, welcomed in their second non-league opponent of the season, the Warriors of West Branch, and were ready to hit the hardwood with some intensity. The first 16 minutes, though, did not go accordingly, as turnovers and difficult shots kept the Warriors close. When the teams entered halftime, the Bison held just a single-point advantage, 17-16. However, the second 16 minutes was a completely different team. Press coverage, smart decisions, and a stunning run of baskets pushed the Bison to a lead that was insurmountable for the visitors to overcome. The final buzzer went off as the Bison earned their second straight win, 57-33. Head coach Nate Glunt was clear what he was telling to his team at halftime as to what they needed to adjust in order to compete. The Warriors took the opening lead on an Ayden Gutierrez layup with about six minutes remaining in the opening quarter, but Clearfield pulled back when Karson Rumsky drained a three-point jumper from the high post. Unfortunately, the story of the first half for Clearfield was turnovers. Between the first two quarters, Clearfield committed 14 turnovers, which kept the game within a basket a majority of the time. West Branch’s big player, Larry Cowder, had the best quarter of any for the visitors in the second stanza, accounting for five of the 10 points put up. Clearfield kept things close, but headed into halftime with just a 17-16 edge and looking for an answer. Cowder finished the night with a team-high 15 points and seven rebounds. “Give West Branch a lot of credit. Danny (Clark) does a great job, and Larry is one heck of a player. They do a good job at moving the ball and executing. Out of those 15, 11 of them he earned, and he made some tough shots,” Glunt said. Clearfield had possession coming out from the locker room, and things got rolling with Rumsky making a three-point shot from the left post to push the lead to 20-16, but Cowder answered right back with a three-pointer of his own. All of a sudden, something ignited in the Bison shortly after. Whether it was them figuring out the defense, or listening to the advice of their coaches while they were behind closed doors, the team suddenly lit up. And light up they did, as they suddenly went on an 8-0 run that pushed the Bison to a lead that stunned the opposition. Clark called a time out to calm his team down, but it seemed to only give a break in the action, as the Bison continued on a 16-2 run to close out a 24-point quarter that got the crowd into the game, and put Clearfield up 41-24 entering the final quarter of play. Keagan (Hess) did a great job in finding Cade (Walker), and when you’re scoring, your defense plays better. Andrew (Lopez) had a big plus-one, Keagan had a huge jumper at the end of the third quarter to get some momentum going,” Glunt said. “Defensively, I thought we boxed out, I thought we made them work, and made them take some tough shots. Walker and Rumsky each finished the night with 16 points for Clearfield, with Walker hammering in a double-double thanks to 10 rebounds. Both Lopez and Taye Lynch accounted for six assists on the night, all of which came in the second half. Clearfield’s biggest asset on this night through the entire game was discipline, as despite only committing eight fouls, they put the Warriors in an awkward spot as they did not see the free throw line until the fourth quarter. Dalton Kristofits saw both his free throws bank off the back of the rim, leaving zero free points from the stripe for the Warriors on the night. Clearfield, meanwhile, went 5-for-6 at the line, including a pair of plus-one shots from both Lopez and Rumsky. With 2:10 left in the game, Glunt called his final timeout in order to get his starters on the sidelines and give the reserves a chance to get some playing time with the game well in hand at that point. Clearfield doubled up on the evening as they took the opening junior varsity game, 49-21, behind Kandyn Hudson’s 16 points. Glunt was extremely pleased with the effort his team put on, and also credited the support of the people that came out on a Monday night to watch his team play. A lot of them were still in the Bison Gymnasium long after the final buzzer went off, something that Glunt really enjoyed seeing. “Our home crowd is absolutely amazing. Yes, some are filing out, but you have so many kids that are just shooting the basketball right now. It’s just a really cool atmosphere,” he said. Even though he’s glad to sit undefeated this early in the season, the schedule for his team doesn’t get any easier, as they open Mountain League play on Wednesday night against Bald Eagle. Glunt was quick to point out that this early schedule for his team would be a grind, especially with the first part of the Mountain League schedule. “Bald Eagle beat West Branch on Friday, so it will be another tough opponent. Then we have Huntingdon on Friday, then Philipsburg and Tyrone…all before Christmas,” he said. The junior varsity game against Bald Eagle will tip off at 6 p.m. Varsity will follow. Eboch 0 0-0 0, Arnold 2 0-0 5, Gutierrez 2 0-0 4, Guerra 3 0-0 7, Bellomy 0 0-0 0, Smeal 0 0-0 0, Kolesar 0 0-0 0, Cowder 6 0-0 15, Thompson 0 0-0 0, Kristofits 1 0-2 2. TOTALS 14 0-2 33. Lynch 4 0-0 8, Kline 0 0-0 0, Hess 2 0-0 5, Walker 8 0-0 16, Rumery 0 0-0 0, Peacock 0 0-0 0, Pallo 0 0-0 0, Rumsky 6 1-1 16, Lopez 2 4-5 9, Hudson 1 0-0 3. TOTALS 23 5-6 57.